Here's an Operation Christmas Child shoebox we packed for a 5-9 year old boy this year. This one we packed in an OCC GO box, we use a variety of types of shoeboxes. If you'd like ideas for other ages be sure to check out my posts on boxes from this year for: Girl 2-4 , Boy 2-4, Girl 5-9, Boy 5-9, Girl 10-14, & Boy 10-14. NOTE: Different countries have different restrictions on what can be packed in an OCC shoebox due to customs, and this is the last year for candy in the USA. Be sure to check the guidelines from your national organization before packing! Candy ( bagged & in original wrapping) UPDATE: As of 2017 candy is no longer allowed. First thing I always put in is flat things, the journal on the bottom, the soft composition book along the back to fold over. Then the soap case and crayons flat next. The candy in the bag could conform around the roof of the Lincoln Logs type kit. The arm of the bear fit between the wheels of the big wheel. Probably should have slid the "field notes" down the side to save more room/protected it. 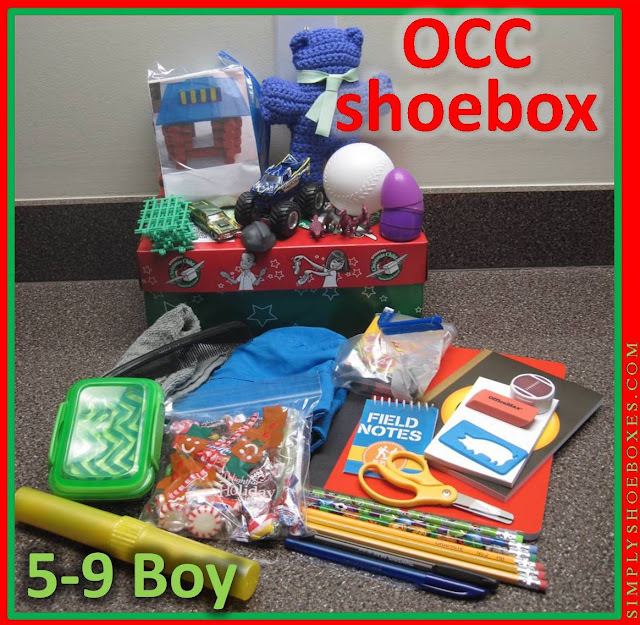 We have posted other 5 to 9 year old Operation Christmas Child shoeboxes you may like to check out.